I had meant to put more Volvo 240s in this series, since the island is full of good examples (and, besides, I'm racing one next month). But somehow a few months have gone by since the last one, so here's a somewhat earlier example I found parked near the '82 Mercedes-Benz 380SL. And yes, I noticed that '79 Civic across the street while I was shooting this Volvo; don't worry, Honda fans, I shot it while I was there. 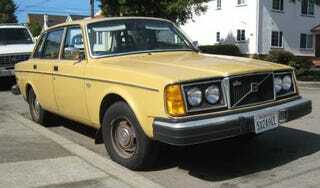 Did Volvo paint half their Malaise 240s this particular shade of mustard yellow? Or was it two-thirds? These cars were pretty pricey when new, with the list on this one set at $6,595 (well over two grand higher than the '77 Malibu sedan and a bit under a grand less than a new BMW 320i). This one is pretty banged up; I could have photographed many nicer examples of Malaise Era Volvos on the island, but this car seems to capture the tough-survivor essence of the Volvo Brick. It drives every day and doesn't care if you think it looks frumpy. And hey, it's got the mighty Lambda Sond (i.e., oxygen sensor-equipped) 130ci engine! We've got some California-style body rust here, no doubt caused by rainwater getting into the trunk after the sun and smog turned the weatherstripping into black crumbly powder. At the current rate of decay, the rust will force this car's retirement by about the year 2089.